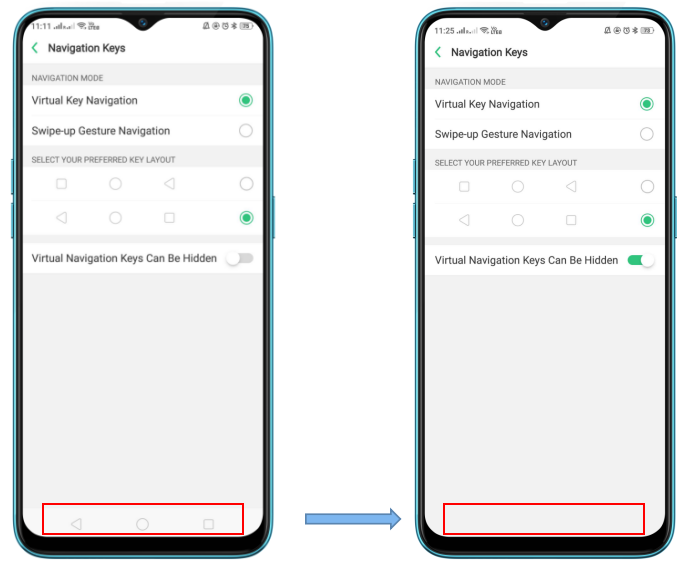 Learn information and usage of virtual navigation keys. Applicable for ColorOS 5.2 device an above. Check your ColorOS version in [Settings] > [About phone]. On-screen virtual navigation keys give a better visual experience, also offers you fast and fluid gestures to operate your phone. You can change the order of the virtual keys, and set them to appear only when needed to free space on the screen. 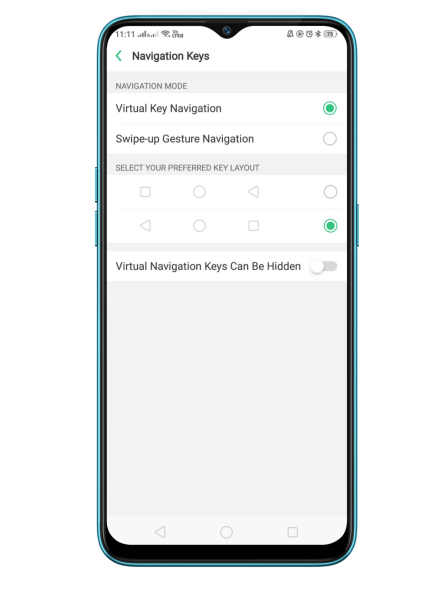 Virtual navigation keys are default on. If you want to enable them manually, go to [Settings] > [Smart&Convenient] > [Navigation Keys] and click Virtual Navigation Keys. Change the order of virtual navigation keys. 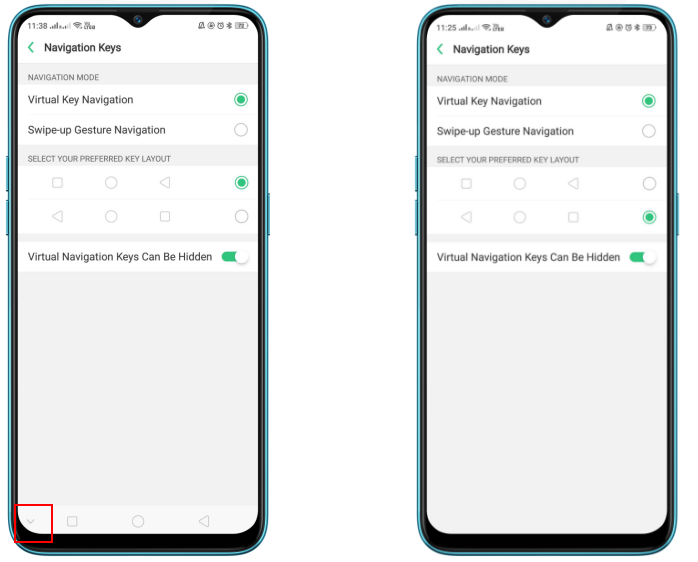 The keys follow the typical order for realme: Menu, Home and Return from left to right. If you are left-handed, you can change them to the return-home-recent order. Hide the virtual navigation keys. 2. When in portrait mode, swipe up from the bottom. 3. When in landscape mode, swipe from the bottom to the left. 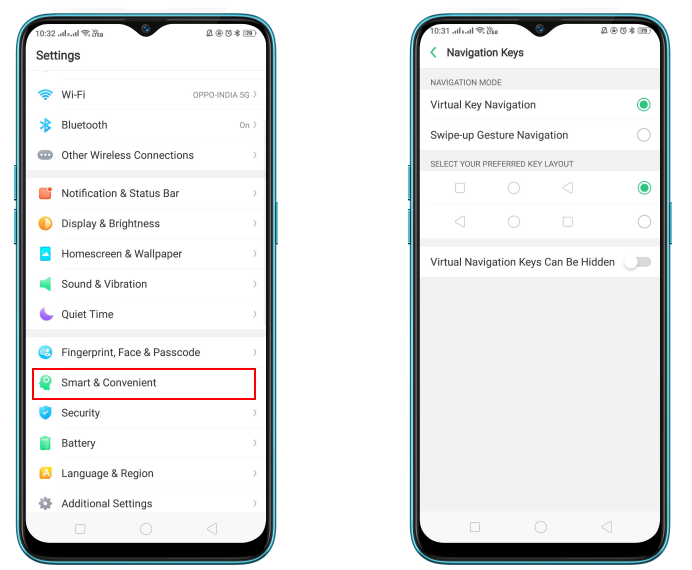 To set the keys to appear only when needed, go to [Settings] > [Smart&Convenient] > [Navigation Keys] and enable Virtual Navigation Keys Can Be Hidden. Then you can clickImageon the left-lower corner of the screen to hide the keys, and swipe from the bottom to reveal them.